World of Final Fantasy is somewhat of a celebration of the series so far. Characters you know and love, return to help face off against an evil threat. Familiar creatures from each game are also here too and not only can they hinder your progress, but they also help you crush your foes. The story begins with twins Lann and Reynn awakening to a ghost town, with sections of their memories having been taken from them. The one other person in town, Enna Kros, explains that they were mighty mirage keepers in their past, though they have been slumbering in a timeless dimension for an immeasurable amount of time. Now that they have awakened once more, Enna Kros, who reveals herself to be God, sends them off to the land of Grymoire to rebuild their legion of mirages, try to find out what memories they have lost, and fight off an evil that threatens the land. As far as the story goes, it is a pretty simple “heroes lose their memories and fight a hidden evil” plot for the most part. This is Final Fantasy however, so the story does morph into something quite complex and over-the-top the more you progress. It does a wonderful job of getting you through the game, but the real stars here are the characters. Lann and Reynn have a brother-sister dynamic that is well written, and really drives the story forward. Their individual personalities mix in a way that presents a lot of hilarious situations and conversations throughout their journey. Lann is the loveable idiot, while Reynn is more intelligent and thoughtful. Because of this dynamic, their arguments are some of the best written stuff you will find in the game. To continue about the writing, each creature, known as mirages, you encounter gets its own entry in a sort of compendium. Each entry has a description regarding the mirage, and these are often laugh-out-loud funny. Overall, the humour in this game hits the mark, even some of the fourth wall breaking stuff that would usually make me cringe. 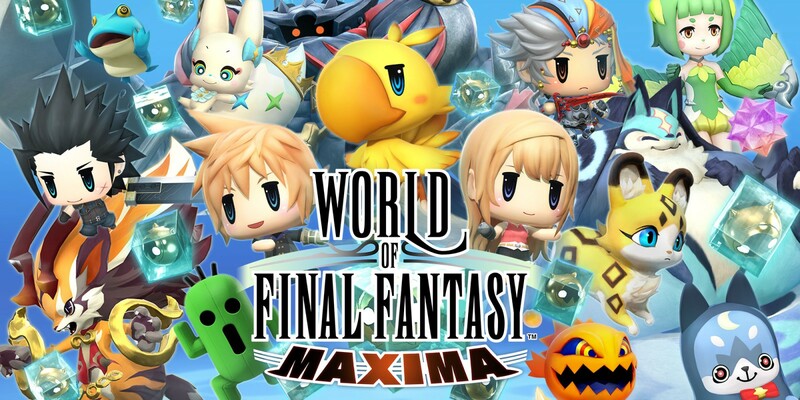 As for the gameplay, World of Final Fantasy is a monster capture style JRPG, much like Pokémon or Shin Megami Tensei. For those who don’t know what that is, it is essentially a game where you capture the beasts that you encounter, and you use them to battle for or with you in future battles. The game is set on a linear path, with small divergences and secrets you can discover along the way. There is no large overworld here, so this is more akin to Final Fantasy XIII’s linear corridor style of exploration. That said, there is a little bit of openness and choice here, and the secrets you find and chests you discover become more than worth searching for the further into the game you get. There is a form of fast travel here, which is done in the form of gateways. These gateways can transport you to any other point in the world that also has a gateway, be it town or dungeon. You can also save your game and switch out mirages. Speaking of mirages, the battle system in this game is a lot deeper than it first appears. There are a few different options when it comes to customising how battles will take place. You can opt for an active or wait style of battle system. The active time battle system happens in real time. What that means is, your opponent will not wait for you to attack before they do. If you can’t decide what move to use in the heat of battle, the opponent will just swing at you when they are able to attack. A bar appears on the side of the screen, and when a characters head reaches the top of the bar, they can unleash an attack. This system is fast paced, though definitely not to everyone’s taste. The wait system on the other hand, is more in line with traditional Final Fantasy titles. When it is your turn to attack, you can choose your move without fear of your opponents attacking you before you are ready. This is the style I went with, but that is because it was easier to use the classic style menu system in wait mode. Speaking of the menu systems, there are two options here. The first is a simplified menu that has a bunch of options attached to each of the face buttons, allowing you to just tap a single button to pull off whatever move you would like. Unfortunately, you forgo a lot of options doing things this way, but if you would like you can use what is called the classic menu. The classic menu is the same one you will find in most Final Fantasy titles, and allows you to choose what magic attacks you use, as well as control over items and everything you need in battle. Because this menu is more in-depth and somewhat cumbersome, I don’t recommend using this in conjunction with the active time battle system. When battling, the options you have essentially break down to being able to attack, defend, use an item, imprism, or run away. Your attack options are to either do a basic physical attack or use a special ability. Your abilities are your magic spells, as well as some harder hitting physical abilities. What special attacks you can use will depend on what mirages you have in your party at the time. These special abilities use ability points, or AP, each time they are used. Each turn you gain an ability point, so unlike mana in previous entries, your AP pool will actually regenerate throughout the battle. Defending is exactly that. Choosing this option ups your defence, allowing you to survive a powerful move an enemy may be preparing to use. Unlike a normal attack, when you defend you only have to wait half as long to get another turn with that character. Using an item allows you to use your healing potions, as well as some items that will deal damage or heal certain status ailments. All Final Fantasy veterans, nay, veterans of JRPG’s in general, know how important items are in battle. Running away does just that, allows you to run away. Running away can fail, and seems to more often than not, but it can be useful if you have the wrong mirages equipped. And finally, imprism. Imprism is just a fancy word to describe capturing a creature. When you come up against a mirage you haven’t acquired yet, you get given a device to capture that particular mirage. To capture a mirage, you need to put it into a capture state. What you need to do to get a mirage into a capture state can vary wildly, and can be as simple as dealing damage, or as complex as using a set of moves in a particular order. This adds some interesting depth and puzzle solving to the art of capturing your mirages, which is nice. When you battle, you actually fight with your mirages stacked on top of your head. Each mirage has a size designation, be is small, medium or large. Each stack must contain one of each sized mirage. As Lann and Reynn are a part of the stack, what are their sizes? Well, that varies actually. Lann and Reynn have two forms Jiant form and Lilikin form. Jiant form sees the siblings in their usual human-looking bodies, whilst Lilikin form has the pair in their cute chibi look. Jiant form is considered a large form, whilst their Lilikin form is considered a medium size. Because of the two forms, you can have two stacks set up for each Lann and Reynn. It is a good idea to set these stacks and switch between them before battles, and have each stack set up to tackle a different type of foe. Speaking of stacks, each creature you add to a stack grants you all of the mirages abilities. Say you put a fire and an ice mirage together, then your stack will not only have fire and ice abilities, but it will also gain the strengths both those mirages have. Keep in mind though that you also gain all of the negatives those creatures have as well. Each mirage in the stack also adds their total health, AP, attack and defensive points, so you are much stronger when fighting together. Adding creatures with the same moves will actually allow your stack to use a stronger version of that move. Say you have a stack with multiple mirages being able to use Fira, then you will cast a Fira that is much more fearsome. Just remember, if you are doing that, you may have a stack with multiple fire type mirages, so their weaknesses also stack. This means that their 50% weakness to water may up to 100% or higher, making you more susceptible to a quick KO if the wrong enemy should appear. Another added layer to the stack mechanic is the fact that stacks can topple over. If you receive enough topple damage, then all your mirages will come crashing to the ground, and you will lose some time before you can make a move with those creatures again. When a stack collapses, mirages on their own are much weaker and more likely to suffer a quick death in just a single hit. There are ways to avoid toppling over. The simplest way is to use an item that will replenish your topple state, allowing you to continue as if you were never about to topple over. The other way is to unstack yourself. Unstacking does take up a turn, and will leave you more open to attack, but you lose about half a turn rather than a full one, so you can likely restock before your enemy has a chance to strike. Speaking of stacks and mirages, you can find and capture XL sized mirages. These creatures are huge, unable to be used in a stack. If you want to use an XL mirage, you will need to summon it in battle. Doing so replaces both of your stacks with the massive creature, and it stays out until it dies or you send it back. You can’t just call them in willy nilly however, so picking the enemy you use it for will be vital. You can also call down champions to do a devastating attack. These champions are famous characters from across the Final Fantasy series, and the more you meet on your journey, the more you can summon. These work more or less like summons have in previous games, where you call the hero into battle, and they make one huge attack before disappearing. You can have three champions at the ready to call on, so make sure you have them equipped. You can also replace your Lilikin form with a champion of your choice. By equipping an item associated with the champion you want to use, Lann and Reynn can be replaced by the likes of Cloud and Yuna. Doing so grants you the abilities those champions have but prevents you from calling in your XL creatures, so this ends up being a double-edged sword. Leveling up mirages is a rather in-depth process. Each time a mirage goes up a level, it gains a point it can use to spend on a sort of abilities tree. This tree can grant the creature new abilities, up its stats, or even add its ‘evolutions’. When you unlock an ‘evolution’, you aren’t stuck with it, as you can choose whichever form of the mirage you want when you select which mirages to take with you at the fast travel gates. Be warned though, whichever form you select is what you are stuck with until you change it at another gate. The visual style of World of Final Fantasy is quite varied. For the majority of the game, you will see a rather cute art style used. The characters are small with massive heads with cute expressions, a style often referred to as ‘chibi’. This chibi style translates over to all of the Lilikins you meet, as well as all the baby forms of classic Final Fantasy mirages that you find. Where the chibi art style is not used, the game will give off a 3D anime vibe, kind of a ‘what if anime was CG’ feeling. All the major villains, along with Lann and Reynn’s Jiant form, and the more full-grown evolutions of mirages. The melding of these two art styles works tremendously well, though if you are not a fan of the chibi style then this one may rub you the wrong way. The cut scenes are done in one of two ways; within game cut-scenes, or fully animated like a traditional anime. The in-game cut-scenes are great, as it looks just like the adventure does when you have control of the characters. The animations are done very well, and the expressions on the characters faces are excellent. As for the anime cut-scenes, these are rather jarring, as they come out of nowhere without warning, and though they are beautifully animated, they just don’t fit the vibe of the rest of the game. Sound effects here are expertly done, with attacks and environmental interactions sounding on point. The voice acting is rather well done here too, with no voices being too grating, besides Tama always adding random “the” into sentences where it’s not really required. You can switch between both the English and Japanese voices, which is a very nice touch. I tend to play games with the Japanese voices, but the English voice acting was good enough to have me leave it with this title. Then we have the music. The music is exquisite, as is to be expected for a Final Fantasy title. There are a lot of the traditional tracks from across the series used here to great effect, and each musical piece is meshed perfectly with what is happening within each scene. Even the tracks that are wholly created for this game are superb, with no track sounding out of place. There are some neat nods with the music for fans too. For instance, you can ride larger mirages to make getting from place to place faster, which is neat. When you choose to ride a chocoholic though, the music will change to the classic chocoholic riding music, which instantly put a smile on my face. World of Final Fantasy also runs extremely well on the Switch. I never experienced any slow-downs or hiccups in either docked or handheld mode and having this game on the go is such a great fit. I know the game was on the Vita when it initially released, but the Vita version was a rather poor experience overall. This Switch version alleviates the issues that version had, and has this handheld version of the game looking and running more in line with the PS4 version, which is great to see. As a homage to the Final Fantasy series as a whole, World of Final Fantasy delivers. With so many fan nods, characters, creatures and sounds from across the entire series, this game will have something for everyone to ever have nostalgia for the series past. The game doesn’t rest on being a simple homage though, presenting a deep battle system, interesting characters that drive an admittedly cliché story, and a presentation that is simply superb. If you are a fan of Final Fantasy, or even just a fan of monster capture style JRPG’s, then I highly recommend picking this one up.